Today we decided to try a “new” idea for lunch: broiled soup sandwiches. 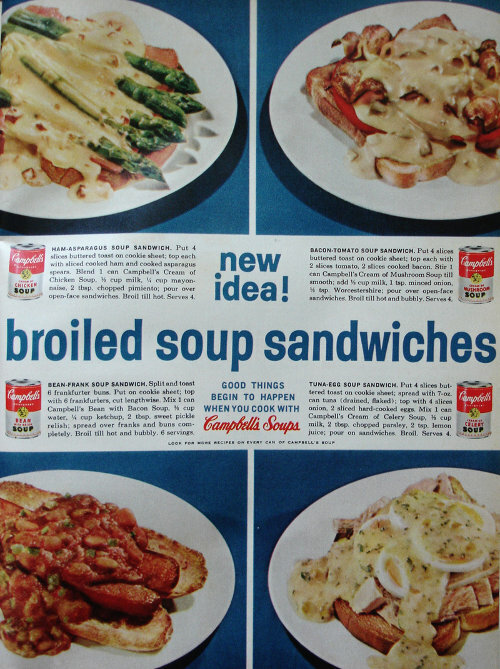 We can always count on Campbell’s soup advertisements to come up with some truly strange attempt to turn soup into sauces, but it’s slightly new for them to invent an entire sandwich line. Put 4 slices buttered toast on cookie sheet; top each with 2 slices tomato, 2 slices cooked bacon. Stir 1 can Campbell’s Cream of Mushroom Soup till smooth; add 1/2 cup milk, 1 tsp. minced onion, 1/2 tsp. Worcestershire; pour over open-face sandwiches. Broil till hot and bubbly. Serves 4. 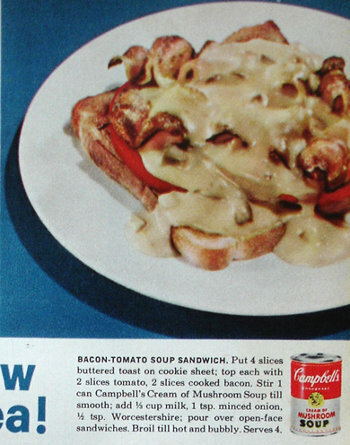 In the accompanying photograph, it looks like cream soup poured over bacon and tomato. Think an open-face BLT, but with mysteriously absent lettuce. Perhaps the green leafy vegetable went on strike? I certainly would be if I heard I was going to get drenched in “sauce” instead of getting to hang out with my regular accompaniment. The pile of ingredients is a strange intersection of sensible sandwich parts (toast, bacon, tomatoes) and… sauce stuff (everything else). A delicious, ripe summer tomato paired with high-quality bacon is a simple but delicious combination. Oh, but this is a broiled soup sandwich, so there has to be soup in here somewhere. In fact, there needs to be soup all over the place. Yeah, I know. It looks like you ordered a BLT, but they were out of lettuce, so instead the cook sneezed on the sandwich and hoped you wouldn’t notice. The soup-sauce itself was surprisingly bland, but it did lend some creamy flavor to the sandwich. It also made everything soggy. The broiling step was pointless — we would have been better off just heating the soup and then pouring it on. Adding the milk was pointless and made it much too runny. Come to think of it… we probably should have just eaten bacon-tomato sandwiches and given away the can of soup. This wasn’t a disastrous dish, but it was definitely an example of an ingredient in search of a recipe. Broiled soup sandwich advertisement was originally shared by Amy Em. on Flickr. Primarily, because, way back when I was a young sailor, anything deemed a ‘soup sandwich’, was bad, no good, the wrong way to do ‘it’, irrevocably broken…and all the four letter word inclusive terms for that you could ever imagine. And even one five letter, FUBAR. I can’t see any good reason for ruining a perfectly good sandwich with a can of soup dumped over it. If it was a little thicker and used as a sauce, with cheese on top – maybe. This brought back very bad memories of the time in school when they ran out of ketchup and decided to put tomato soup on all our food instead….